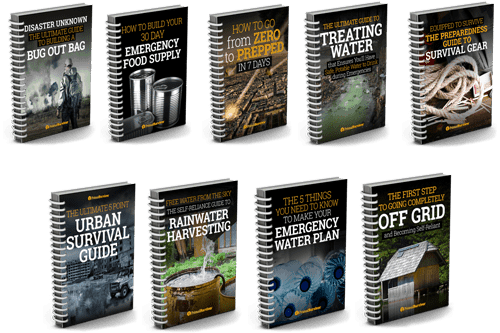 When it comes to survival tactics and gear, there is little that survivalists can agree on. But there is one thing that all survivalists all say for certain: You need a survival knife in with your supplies. Having a survival knife means you can do things like make your own cordage, make shelters, baton wood, and skin animals with a lot more ease. 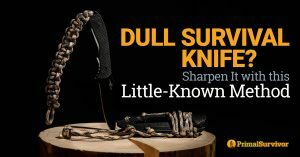 But a dull survival knife isn’t going to do you much good. In fact, a dull survival knife can be very dangerous! When a survival knife is dull, it can slip off an object instead of cut through it. The knife blade is still sharp though, so it can cut you as it slips off. This is why dull knives are responsible for more injuries than sharp knives. One smart solution is to always carry a sharpening stone with you in your survival supplies. 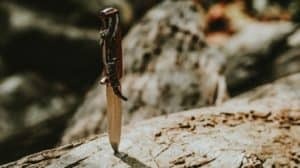 But, if you find yourself in the bush and need to sharpen your blade, you can use this little-known method for sharpening your knife. When sharpening a knife with natural materials, you have to be aware that most natural rocks are NOT uniform in hardness. Rocks contain various different minerals, each which have a different grain size and hardness. So, if you grab just any rock and try to sharpen your knife with it, you could end up making nicks in your knife blade. 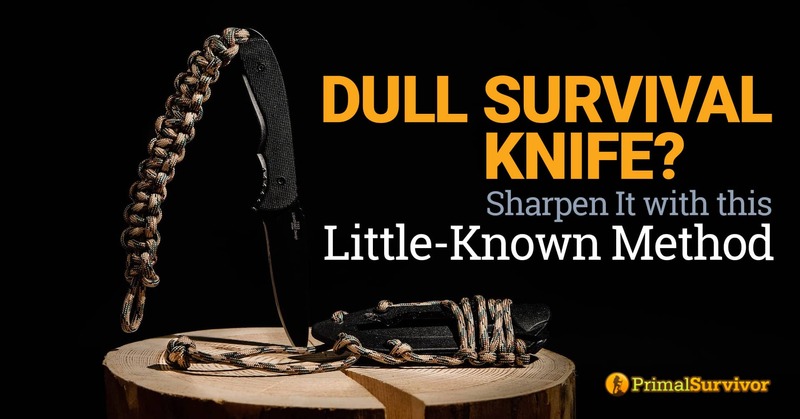 A jagged knife blade isn’t going to help you much more than a dull knife blade would! 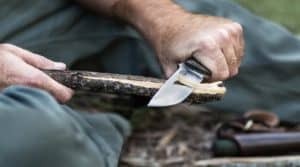 With this in mind, the secret to sharpening your survival knife in the bush is to find something with a uniform hardness and fine grain. This sand method works well. Sand is very fine grain, so it works well for sharpening a survival knife and getting a uniform edge. This is something that most rocks will not produce. If you can’t find any sand, you can make sand by gathering small stones (preferably from a river) and crushing them into a pulp with a bigger stone. The stones need to be crushed to the point that they turn into mush. Now you need to snap off a tree branch. It is important that the tree branch is still alive because it will contain moisture inside of it. The moisture acts as a lubricant while also helping to trap the sand within it. Shave the bark off of the branch (careful, because your survival knife is dull!). The branch needs to be at least 3 inches in diameter. The larger the better. If possible, try to carve down the branch so it is flat. The flat side will hold the sand better and be easier to sharpen your knife on. Put your sand mush onto the branch. Try to rub it in there pretty well. Don’t overdo it though. You don’t need to sand down your fingertips! Rub your knife back and forth over the sandy branch just as you would with a whetstone (at about a 30 degree angle). You’ll have to reapply more sand mush multiple times. A much more intensive way of making this is to make your own bushcraft sandpaper. The video below explains you how to do it – you’ll need pine sap resin for it. You can then put the sandpaper on a board and will have your own sandpaper whetstone. Again, I want to emphasize that you can’t just grab any rock you find in the bush and use it to sharpen your survival knife. The rock needs to have a uniform grain size and hardness. But, in a pinch, you can use these other methods for sharpening your knife in the bush. River stones are good for sharpening knives because the water has worn the surface down to a very small grain which helps produce a uniform edge. If you can find it, sandstone also is good for sharpening a knife in the bush because it has a fairly uniform grain. Remember to always keep the stone wet while you sharpen your knife with it! The stone will take away small metal shavings from the knife. These shavings are called “swarf.” The water will help carry away the swarf so your blade doesn’t continually go over it and get nicked. Another cool solution for sharpening a knife in the bush is to take two round rocks (uniform in size and hardness) and put them together to make a V run. Run your knife back and forth in the space between the rocks to sharpen the blade. I normally hate that there is trash everywhere in nature. But, when SHTF, we will all be glad that the world is filled with trash. With some creative thinking, the trash can be used for survival purposes – including sharpening your knife. Find a piece of glass with a flat edge. Rub the sharp side of the glass over the knife blade at a 30 degree angle until it becomes sharp. An “old school” method of sharpening knives is simply to rub two knives against each other. You might have seen your mom or grandma do this. It takes a bit of practice to sharpen knives this way. You’ll have to hold one in each hand and stroke them away from each other. The key is to stroke along the entire length of the blade with an equal amount of pressure. Stroke so each knife is at a 30 degree angle, first doing one blade side and then the other. You can use cement or a brick for sharpening a knife. 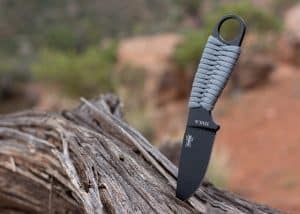 It will scratch up your blade side to all hell, and won’t produce a very sharp edge – but it will get the job done so your knife at least isn’t dull anymore. If you have a leather belt, you can use it to strope your knife. This won’t get it very sharp, but will help to remove any burrs which might have gotten on the blade and improve its cutting ability. Do you know any other ways for sharpening a knife in the bush? Let us know! 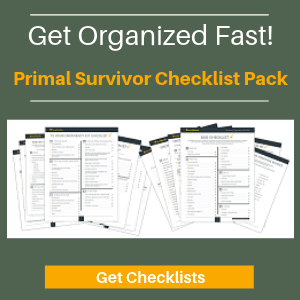 Join the discussion in the Primal Survivor Facebook group. Too many people think that the only material for a knife blade is some super-Vibranium metal. Good luck sharpening that in a clinch. Better to use high-carbon steel & get used to lightly oiling the blade when you’re through using it. Worked for the old-timers, & it works fine for me. I’m sick of spending >20 min. on each side to get back a razor edge. Take along two knives & just use steel against steel for most retouching. I have used sand stone for sharpening a knife I found a piece that was really good made and cut it to proper size for any knife I have I did this back when I was probably 20 years old and I still have it in my sharpening equipment box I don’t use it anymore that much as I have very good quality sharpening equipment now and some of it is over 100 years old. Also have Arkansas hard and soft sharpening stones that I use on a regular basis now. 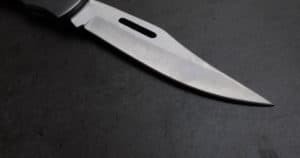 Here is another sharpening tip I have used the edge of a car window that was rolled down part way to sharpen my knife when I did not have access to a sharpening stone. I have also used a ceramic block a friend got me from a plant he worked at and that thing does awesome. I have even used a sharpening steel to keep my knives touched up as well. Even have used a piece of leather nailed to a board. Hey Matt, awesome tips there. A bit of ingenuity goes a long way.